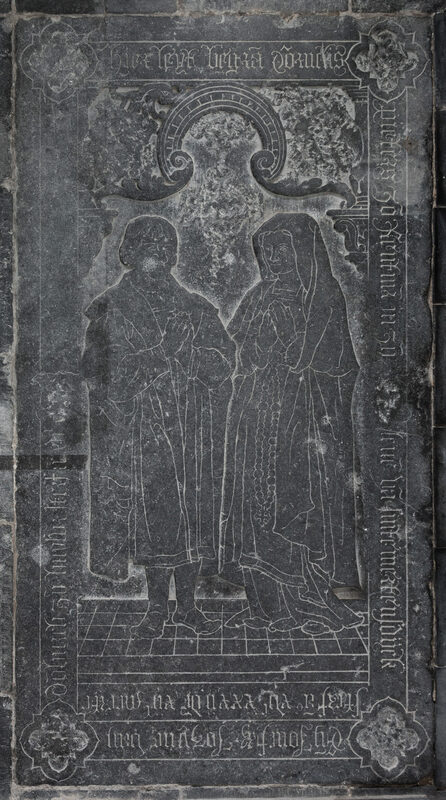 This month’s monument is found in the Dutch coastal province of Zeeland, which is unusually rich in late-medieval incised slabs. The small town of Sint Maartensdijk (part of the municipality of Tholen since 1971) was a flourishing settlement in the Middle Ages and acquired town rights in 1491, albeit without having its own representative in the States of Zeeland. Jacqueline of Hainault (the repudiated wife of Humphrey, Duke of Gloucester), Countess of Holland, and her fourth husband Frank van Borssele had a castle on the north side of the town, which was demolished in 1819. The church is dedicated to St Martin. The tower dates from c.1350, but the body of the church was built in late-Gothic style during the fifteenth century. Frank van Borssele made it a collegiate church in or around 1429, which provided great wealth. 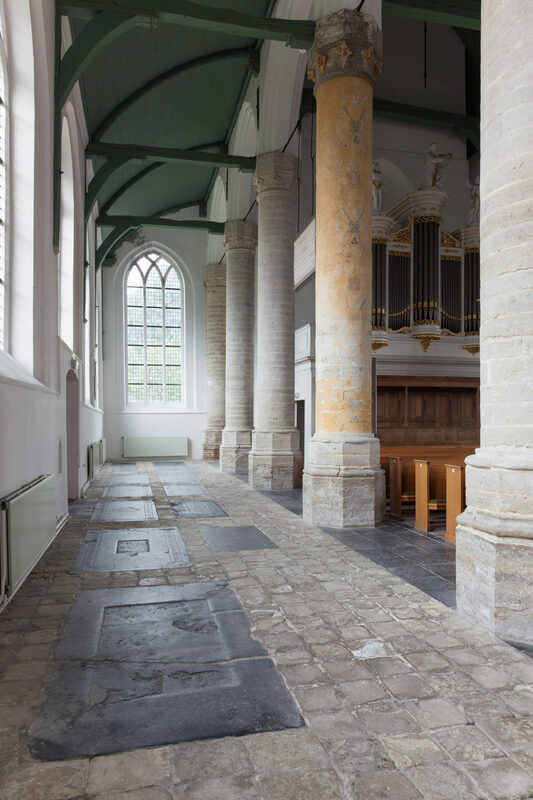 Thanks to the collegiate church and the prosperous Van Borssele court nearby, Sint Maartensdijk enjoyed prestige as well as influence amongst the towns in Zeeland. 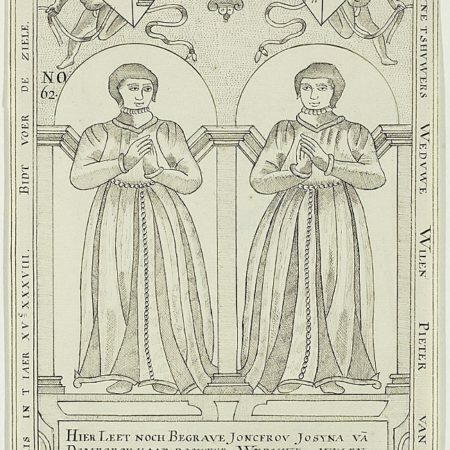 Hier leyt begra(ven) Cornelis / Pieters zo(on), rentm(eeste)r in zij(n) leve(n) va(n) Sinte Mertensdijck, / sterf a(nn)o XVc XXXII de(n) XIIt(en) meerte. // En(de) joncfr(ouw) Jozijne van / Do(m)burch, zij(n) huysvr(ouw), sterf a(nn)o XVc […]. The slab shows husband and wife as if alive, turning towards each other and standing on a tiled floor, their hands raised in a gesture of prayer. He is shown wearing a below-the-knee gown pulled together across his legs; it has wide lapels and what would be a square flat collar at the back of his shoulders. The sleeves of his gown have two horizontal slits edged with a ribbon laid flat as a trimming; the sleeves on his forearms belong to his doublet, which seems to have a square neckline, above which we probably see the gathered edge of his shirt collar. He also wears ‘hammerhead’-toed shoes. The female figure is not dressed as a widow. She is dressed in a gown with a high-set square neckline; the skirt is lifted somewhat to reveal the kirtle skirt underneath. Netherlandish women appear to have worn cloaks over their heads when out of doors, and probably also for going to church. It seems to have a heart-shaped dip at the centre top, in the way that a starched linen headdress of the period would have had. What appears to be a small flower above her left temple is in fact a mark of the fossilised coral Michelinia (favosa), typical of Belgian hardstone; an even larger mark mars Cornelis’s face. 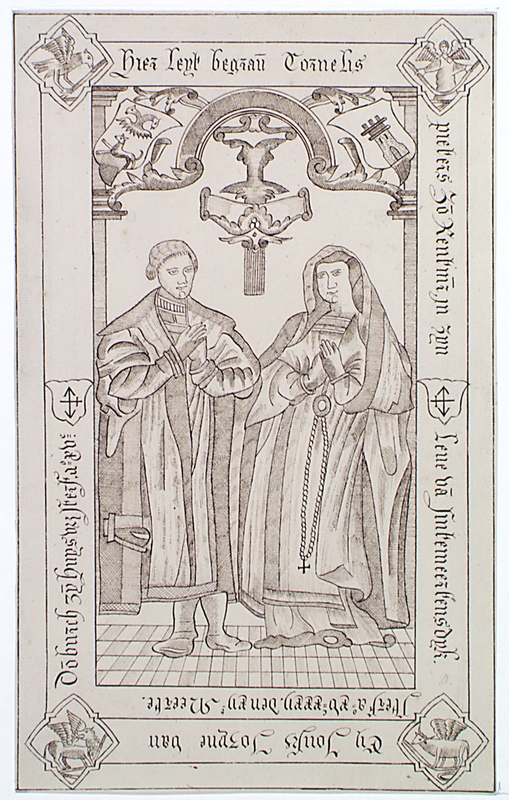 A rosary with a cross hangs down the front of Jozijne’s skirt as a sign of her piety. 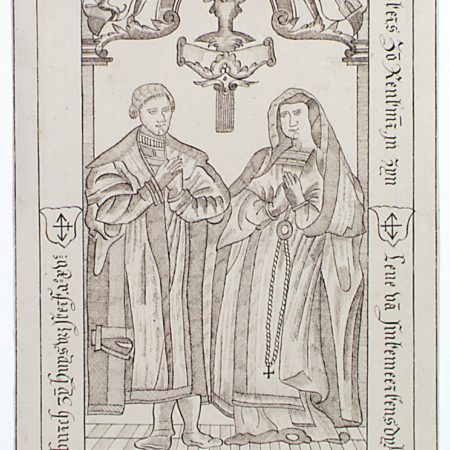 The couple’s attitude of prayer and the woman’s cloak and rosary would thus be particularly appropriate for a monument in their local church. 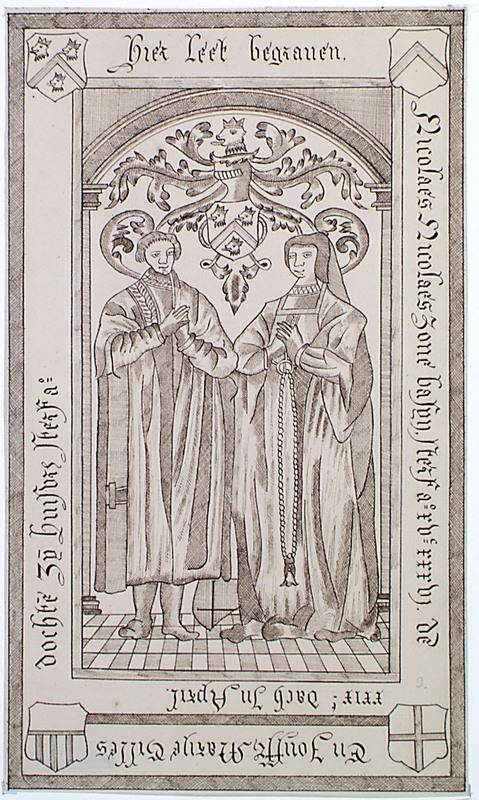 The two elegant figures have been carved in the taille d’épargne technique with incised lines for the inner drawing. The design has been confidently executed by highly skilled craftsmen able to meet the local demand for effigial slabs. 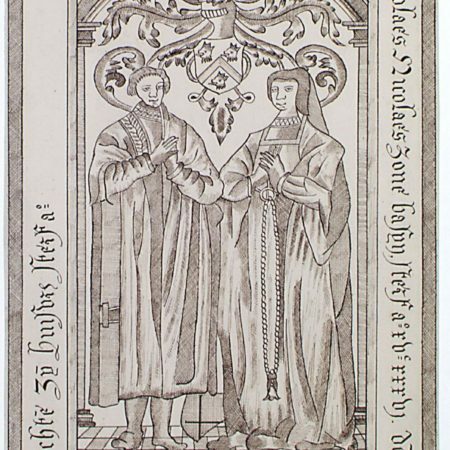 The worn double slab to Niclaes Niclaeszoon Basijn (d. 1536) and his wife […] Gillesdochter in the same church is very similar in design. 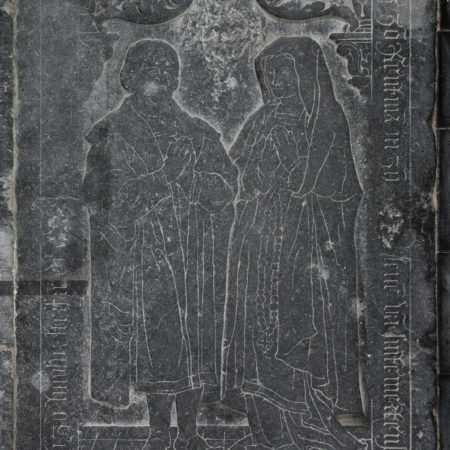 Although the slab of Cornelis and Jozijne is in good condition, considering its age and position, it has suffered the typical vandalism of the French occupation in the late 1790s when marks of heraldry and rank were considered at odds with the new desire for égalité. The heraldic shields in the spandrels of the decorated arch above the figures and the banderole in the centre have thus been hacked away completely, while the housemarks on the shields halfway down the lateral text bands have been effaced. 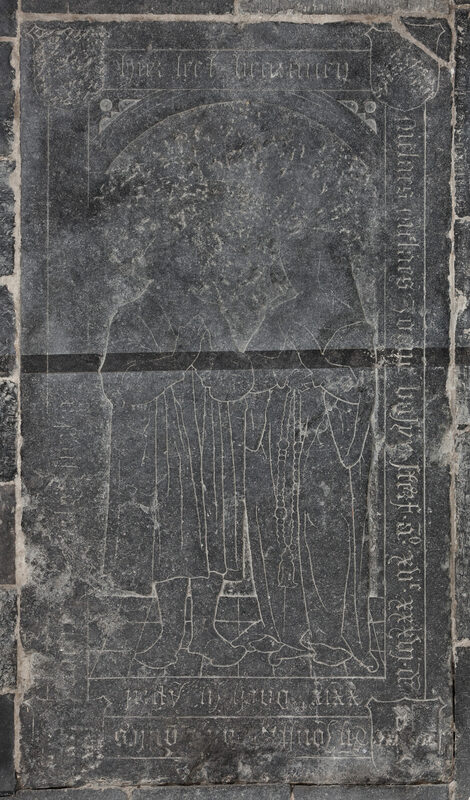 Curiously the quatrefoils in the corners of the slab have also suffered the same fate, although these contained the evangelist symbols that are commonly found on medieval memorial slabs. 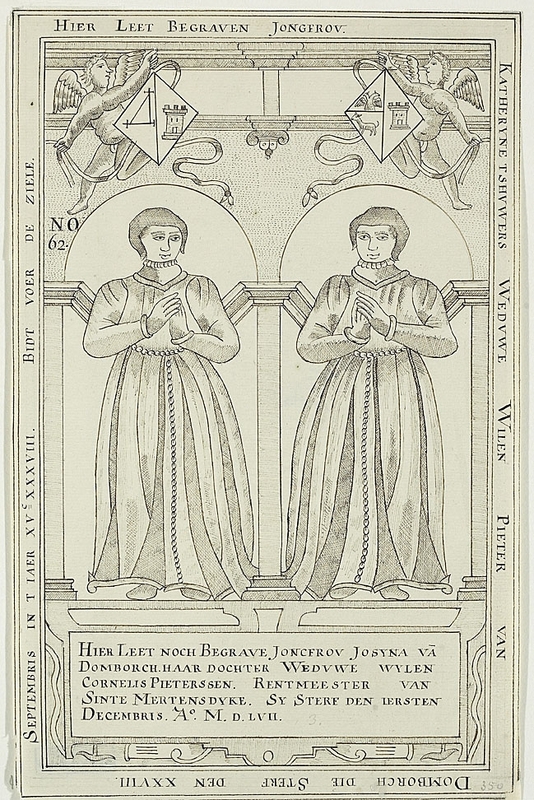 An antiquarian drawing in the collection Zelandia Illustrata shows the slab as still intact, although the artist misinterpreted the two horizontal slits in the man’s right sleeve as some sort of buckle. There is an interesting sequel to this double monument as Jozijne was apparently never buried with her husband. 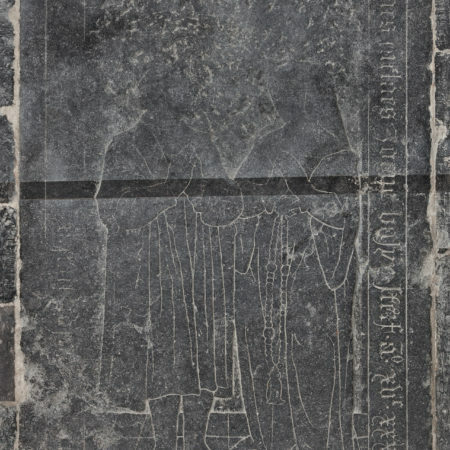 She is instead commemorated with her mother Katherijne Tshuwers or Tschauwers (d. 1538) on a still extant, double effigial slab in the church of Our Lady in Tholen that was recorded by the same eighteenth-century draughtsman: it is here that we find an inscription with Jozijne’s date of death. 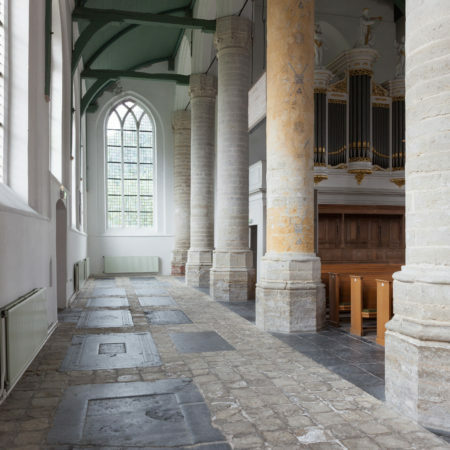 The slabs in Sint Maartensdijk and Tholen and others across the Netherlands will be included in the database of the MeMO (Medieval Memoria Online) project that is currently being completed for its launch at http://memodatabase.hum.uu.nl in early February 2013. See also http://memo.hum.uu.nl/ and http://memo.hum.uu.nl/oudewater/index.html. With thanks also to Dr Margaret Scott for her analysis of the dress of the two figures, Drs Hendrik-Jan Tolboom for his identification of the fossil inclusions, and Dr Harry Tummers for his comments. ● F.A. Greenhill, Incised Effigial Slabs. A Study of Engraved Stone Memorials in Latin Christendom, c.1100 to c.1700, 2 vols (London: Faber & Faber, 1976), vol. II, 184. ● http://www.zeeuwsarchief.nl for antiquarian drawings by Korstiaen Bestebroer in the collection Zelandia Illustrata. ● Hans van Dijk, ‘Vloerzerken in Zeeland. Vloerzerken met persoonsvoorstellingen, ca. 1300-1600’, 3 volumes, unpublished MA dissertation supervised by Dr Harry Tummers, (University of Nijmegen, 1989), esp. vols II (catalogue) and III (plates), nrs 119 and 131. Copyright: Dr Sophie Oosterwijk FSA and Kees Knulst BA.